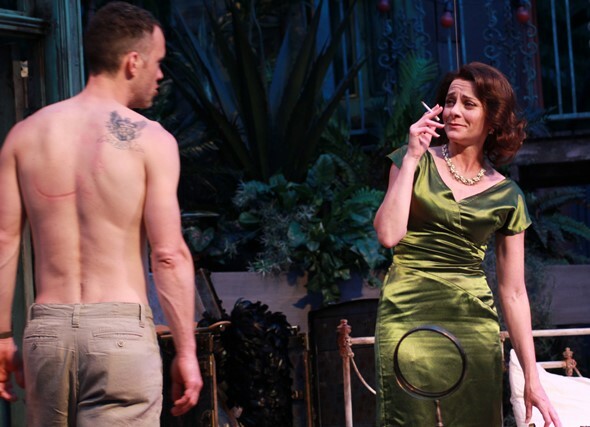 Interview: Actress argues for pluck and cleverness as the worn Southern belle in Tennessee Williams’ “A Streetcar Named Desire,” at American Players Theatre in Spring Green, Wis. Through Sept. 5. 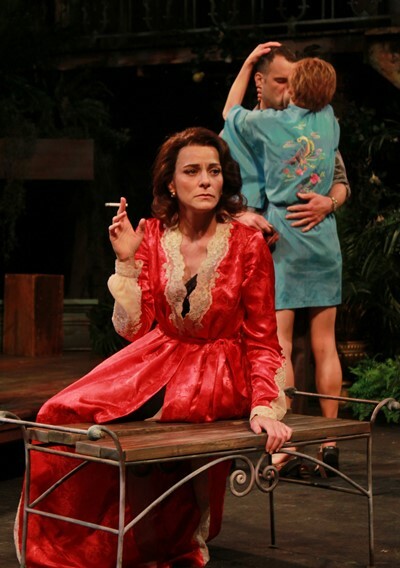 Tracy Michelle Arnold, who portrays a feisty and resourceful Blanche DuBois in Tennessee Williams’ “A Streetcar Named Desire” at American Players Theatre, doesn’t buy the common perception of this embattled woman as “a crazy person.” Arnold sees Blanche as a scarred fighter who never gives up her struggle to survive, even at the end. Blanche shows up on the doorstep of her sister Stella’s meager, bare New Orleans apartment because she has been effectively run out of town at her last stop – fired from her job as a high school English teacher for seducing an under-age boy. She’s also hounded by a crimson reputation for hosting the soldiers at a local military base. What pushed her down that path was a quick succession of traumatic events: discovering first-hand that her handsome new husband was gay, then blurting out a cruel comment that prompted him to put a gun to his head. Blanche saw the result and seemingly never got over it. She keeps trying to recapture her lost chance with other young boys, as if hoping for a different outcome. 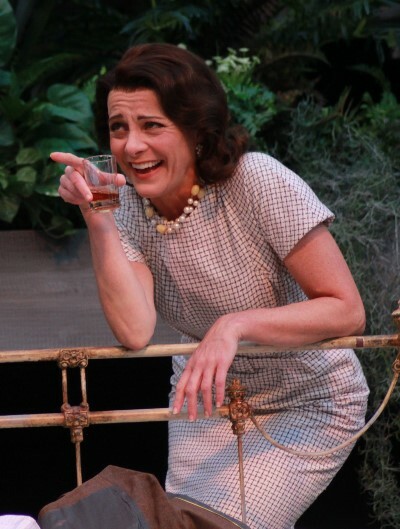 And of course she must contend with Stella’s (Cristina Panfilio) pugnacious husband Stanley (Eric Parks), a pugilist worthy of Blanche’s wiles. “Blanche has no expectations of Stanley because she’d never met him,” notes Arnold, “so we had to figure out how their relationship would go. Blanche is used to the men she knew back home, and she’s met all types. She wouldn’t waste her time with a man who resorts to violence to get his way. Now she encounters this man who is crass, crude and unapologetic – even proud of it in a way. Then she sees him hit her sister, who is pregnant. “So how does Blanche deal with Stanley? We discussed this a great deal in rehearsal. She’s very good with men. Her sexuality is one of the tools in her kit, and of course she would use that with Stanley – outside Stella’s presence. Eric and I have played opposite each other many times. We’re very comfortable that way, and not afraid to experiment. The first few weeks, I was working on Blanche as someone who was more afraid of him, intimidated by his animalism – by this creature who doesn’t want to allow me in his space. Then we decided to explore Blanche’s strength. At stake in the battle between Blanche and Stanley, says the actress, is Stella. Blanche is suffocating in this tiny dump of an apartment where she has slept for months on a cot off the kitchen, her privacy as thin as the curtain that separates her from Stanley and his poker night pals. In the end comes the iconic line, as Blanche is being led away to an asylum by an older man and his assistant. Typically read as the distracted words of distraught woman who has lost touch with reality, Blanche says: “I have always depended on the kindness of strangers.” But Arnold puts a stunning spin on it, throwing what becomes an acerbic comment into Stella’s face. “From the first rehearsal, I knew I wanted to say that line to Stella,” the actress says. “She knows what she’s saying: ‘I have to look to strangers to take care of me. You left us all. You were never there when all those (family members) were dying and I had to find a way to pay for their funerals.’ I don’t think she’s had a psychotic break. I don’t think she’s out of her wits. While Arnold acknowledges that playing Williams’ troubled, aging Southern belle outdoors in APT’s Up-the-Hill arena takes a physical toll, she insists she can leave the emotional wreckage on the stage. “Between the dehydration and having to project through wind and humidity, by the end of a performance my muscles are crazy aching,” she says. “But when a play is written as impeccably as this one, if you can get your dominoes lined up right, it isn’t really hard to perform. All you have to do is walk into that courtyard, and you’re good to go.